Nikon's new projector camera: kit kudos or gimmicky gadget? Nikon's original projector camera, the S1000pj was incredibly innovative, combining a decent camera with a projector. The Coolpix S1100pj is a retro looking compact,similar to its predecessor, but rounder and funkier. Nikon has done very well to cram all the technology into this relatively flat body, without turning it into a bulky beast. The projector and the need for a focus wheel gives the camera a different look from run of the mill compacts, but it's still uncluttered - in fact you only have three buttons on the back. Build quality is good and it feels nice in the hands, it's very much a decent bit of kit, not a cheap gimmick. Activate the projector by pressing the button in the centre of the focus projection. You can project from as close as 20cm up too 2m. A3 sized pictures look okay (that's from around 1m) but we wouldn't take it much further as it isn't very bright, despite being listed as 14 lumens, 40% more than its predecessor. The projections look good, but not amazing and are certainly not a crisp as photographs, and the same goes for video. However, it's a completely new viewing experience, which would be great at parties. 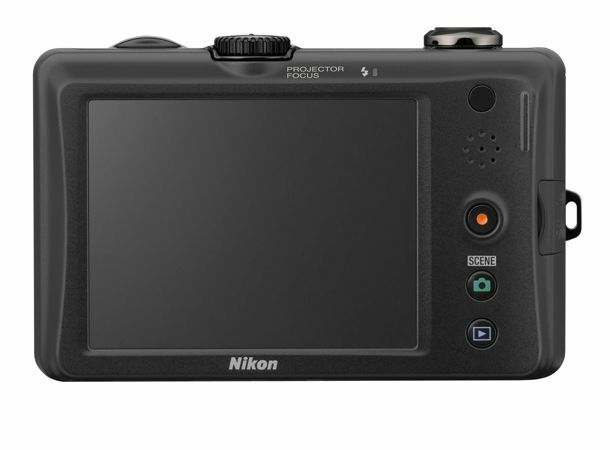 You can also connect the Nikon S1100pj directly to your computer, so you can project images, or indeed presentations, from computer, via the camera, which is great for business users. While the built-in projector is obviously the Coolpix S1100pj's headline feature, let's not forget it's a camera. It has a 14.1MP sensor (S1000pj was 12MP), 5x zoom Nikkor lens and lens-shift and electronic vibration reduction. Image quality from the Nikon Coolpix S1100pj is good: sharp, with crisp edges and realistic colours although the camera doesn't handle high contrast particularly well and you will see some chromatic aberration. There are no manual modes, it's a basic point and shoot. You get Easy Auto, Auto, Smart Portrait and a host of Scene modes. In Auto mode you can change ISO, white balance and exposure compensation, but that's as far as creative settings go. A Retouch Menu enables you to edit and enhance in camera, effects include Fisheye, Soft Focus, and a clever Miniature Effect. Of course there's video too, assessed via a convenient and prominent record button on the back. It also boasts a new 3-inch high resolution touch screen, which means the back is free from multiple buttons, although you have to apply more pressure than is normal and the interface is slow. With an SRP of £349.99 it's not a cheap option and at this price point, if you just wanted a camera you could get a high end compact with manual features, such as the Canon PowerShot S95. However, if you'd enjoy - and use - the projector, which is what you're paying for, then get one and enjoy it – it'd be great for Christmas gatherings!